Darien's Ellie Bullitt, left, and New Canaan's Jana Persky, right, during a girls hockey game in Darien, Conn. on Wednesday, Jan. 20, 2010. 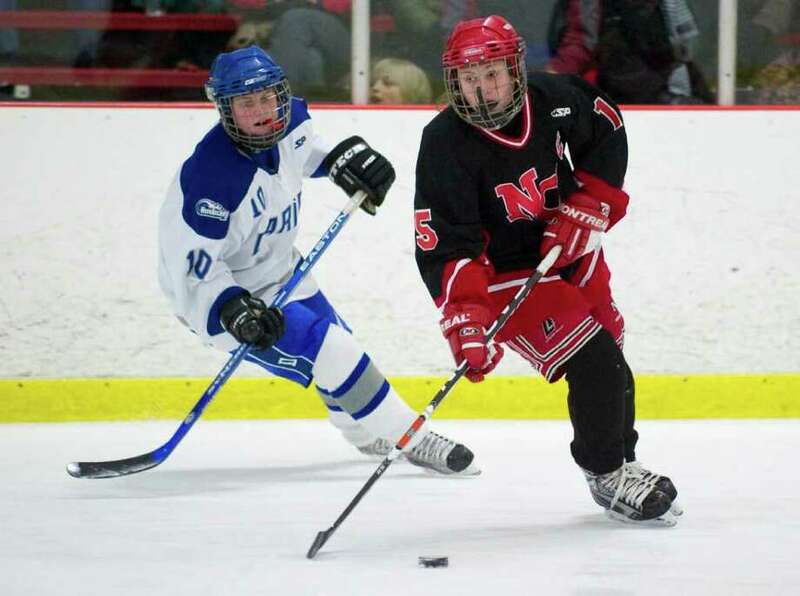 After a distinguished athletic career at New Canaan High School, senior Jana Persky is going to have a big decision to make after she graduates high school and ventures into the college world: Ice hockey or soccer? It's apparent that she has the talent to play either one, but Persky indicated that she's currently leaning towards soccer. "I haven't made up mind, but I'm probably not going to play hockey," Persky said. "I'm going to decide on a college based on academics, but I'd like to play soccer." As a center-midfielder for the school's soccer team, Persky led the Rams to 10-3-2 record, an FCIAC tournament appearance, and a trip to the state tournament semi-finals. Persky, a third year hockey captain, has tallied 190 career points and is quite likely to hit the 200-point plateau before the Rams' regular season concludes. Through the first 14 games on 2010-11, Persky is second on the team in all three major offensive categories: points (51), goals (27) and assists (24). However, for Persky, the focus has never been on individual accolades. "I don't really think about [200 career points], to be honest," Persky said. "I obviously like scoring goals, but not just for sake of scoring. It's for helping the team win. It's never about individual statistics on this team." Even after the senior center was featured in the Thursday, Feb. 3 issue of "Sports Illustrated" for her prowess on the ice, she was quick to deflect the attention back to her team. "It was kind of a thrill to open up a magazine and see picture of your face. A lot of my friends and family saw it and thought it was cool," Persky said. "We have such a talented team from top to bottom. We feel like we can only beat ourselves." It's the kind of selflessness combined with Persky's passion for hockey which led to coach Rich Bulan naming her a captain when Persky was entering her sophomore season. "As good as she is on ice, it's what she does off ice that's tremendous," Bulan said. "She's a great leader. She really has passion for what she does." As defending FCIAC and State Champions, the Rams came into the 2010-11 season with a target on their backs, but they've embraced the lofty expectations to repeat by starting the season 13-1, best in the FCIAC's. The Rams have scored six or more goals in 12 out of their 13 wins. New Canaan's top line of Persky centering sophomore wingers Olivia Hompe and Bea Eppler has been particularly lethal. The trio seems to light up the stat sheet with relative ease on a nightly basis. "Olivia is great player. She's the best I've ever played with in terms of seeing ice. If you get the littlest bit open, she'll give you a perfect pass," Persky said. "Bea is great, too. All three of us are used to playing together, so that's one of the strength of our games." Another big key to the success of his top line, according to Bulan, is the manner in which Persky embraced her two younger linemates right from the time their joined the squad as freshmen. "Jana is one of those players that, as good as she is, she absolutely understands how to work with her teammates," Bulan said. "Jana embraced the younger players. She understands how to talk to and lead her teammates." Still, it wasn't all that long ago when Persky was one of the youngest players on the team, and she still fondly recalls how her teammates embraced her as team captain, even as a sophomore. "It's been kind of a unique situation," Persky said. "It was definitely a hard adjustment coming in as freshman and then having very different role on team, but we had great upper classmen who accepted me as a player, as a captain and as a teammate." If her senior year at New Canaan is indeed her last season as a hockey player, Persky is aspiring to go out in style. "Repeating as champs is the goal," Persky said. "I've been here for four years and every year the goal is for an FCIAC and state championship. There are plenty of good teams out there, so there's a lot of work to do."